The spiritual leaders of the Protestant Reformation influence our faith every day. Learn more about their world-changing thoughts, biblical foundations, and passion for God's grace in Captivating Grace. Scripture Alone, Faith Alone, Grace Alone, Christ Alone, and To the Glory of God Alone--these are the Five Solas and the basis for this beautiful collection of devotions. 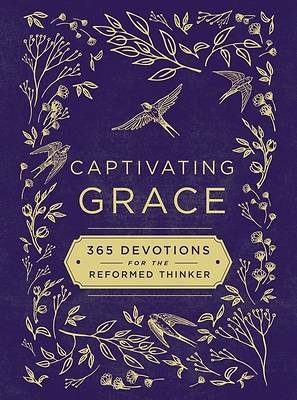 The writings within each theme are drawn from the books, sermons, and commentaries of the most influential figures of Reformed thinking, including Martin Luther, John Calvin, and Charles Spurgeon. Each entry in this daily devotional includes a Scripture and a short reading. Captivating Grace is a thoughtful gift for new Christians, seminary and college students, and anyone who wants a richer spiritual life, as well as newly ordained pastors and church leaders who need encouragement. With its classic design, Captivating Grace is also a wonderful keepsake for a personal library. Here you will find treasured insights from the greatest voices of Reformed theology bound together with God's unchanging Word. Pre-Order This Title Order now, item will be available on 1/1/2020. Ships from a Cokesbury Connect Partner.